Many non-surgical and surgical treatments have been described for CMT. Current non-surgical treatment includes splinting and custom orthotic devices. Generally, conservative methods alone are unsuccessful in correcting or preventing progression of deformity. They should be used in conjunction with surgical treatment. The main indications for surgical treatment are gait problems, ankle instability, ulcerations caused by high-contact pressure, and difficulties in shoe wear. 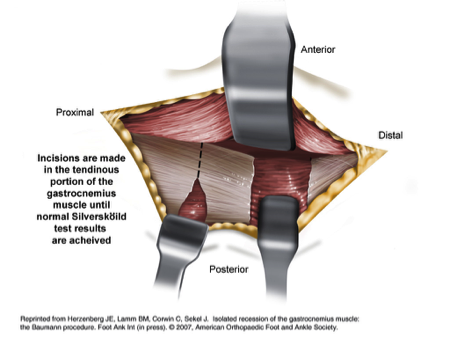 The first step is to perform a Bauman-procedure incision, approximately two finger’s length from the posterior (toward the back) edge of the tibia. This incision is at the junction of the gastrocnemius and soleus muscles. The area is carefully dissected in order to avoid damaging the saphenous vein and nerve. The gastrocnemius muscle is exposed and released. The ankle joint is dorsiflexed (pulled upwards) until normal range is achieved; this process is known as a Silfverskiøld test. The next step is to perform a tarsal tunnel decompression. This surgery can place added stress on the already taut nerves, which can lead to tarsal tunnel syndrome. Tarsal tunnel syndrome is similar to carpal tunnel syndrome, but in the foot, and results when there is pressure on the posterior tibial nerve near the ankle bone. 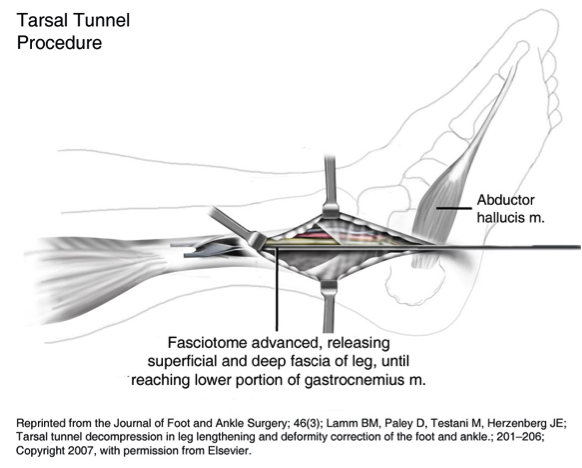 The soft-tissues of the tarsal tunnel are released, minimizing pressure on the posterior tibial nerve. Most of the foot deformity in CMT is due to a tight plantar fascia. 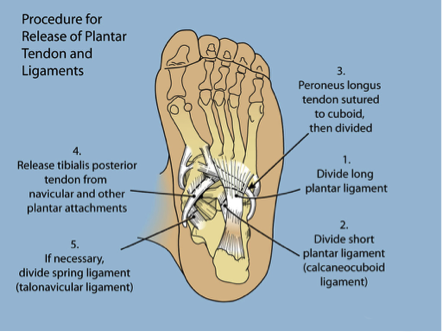 The plantar fascia is the ligament that connects the heel to the toes. 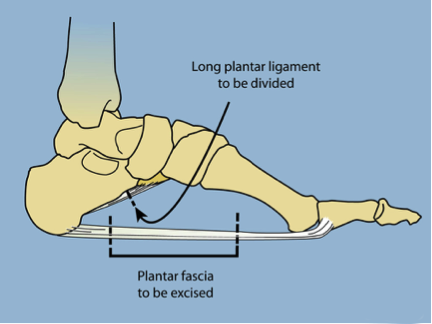 A release of the plantar fascia is performed to correct the cavovarus deformity. The incision is placed on the sole of the foot and the plantar fascia is excised. Additional soft tissue structures are released, including the plantar ligaments and the posterior tibial tendon. Patients with CMT often have weakness in the dorsiflexors of the foot, resulting in foot drop. The dorsiflexors are responsible for pulling the foot upwards. Contracture of the posterior tibial tendon is the force that results in weak dorsiflexion. 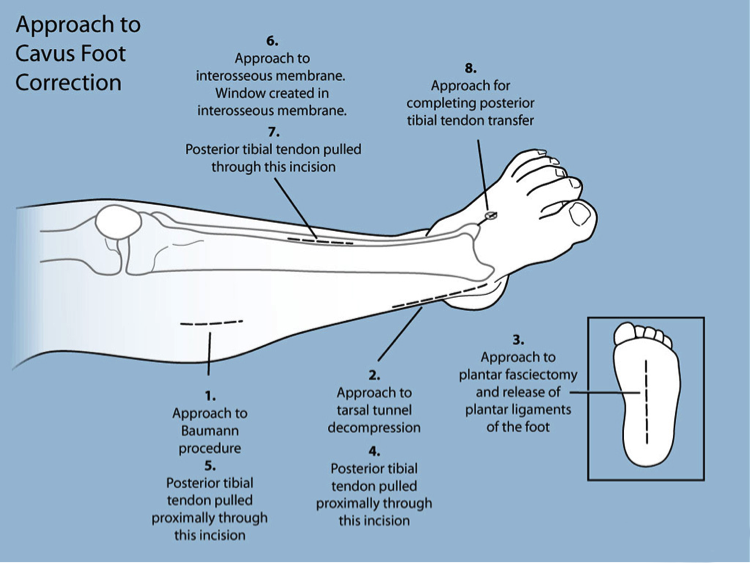 This is corrected by transferring the posterior tibial tendon to the lateral cuneiform, a bone located at the outside of the foot near the toes. 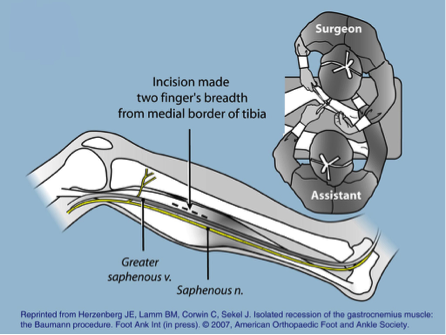 This is accomplished by first removing the tendon out of an incision at the side of the foot and passing it through the Bauman incision from step one. 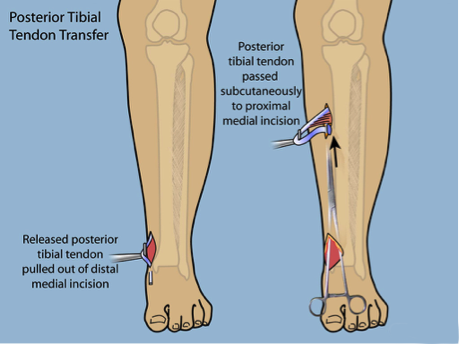 Another incision is made and the tendon is passed through the interosseous membrane, which lies between the tibia and the fibula. 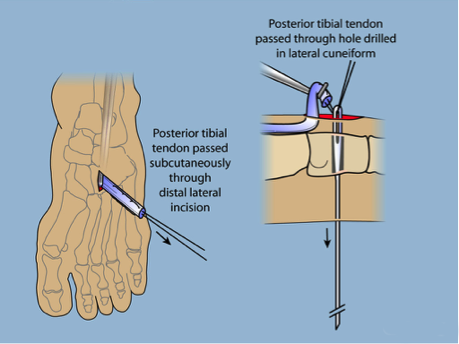 The tendon is passed through another incision at the foot and passed through a hole drilled in the lateral cuneiform. 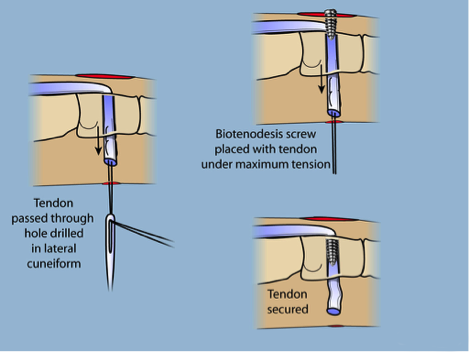 The tendon is secured in place at maximum tension with a bio-tenodesis screw. 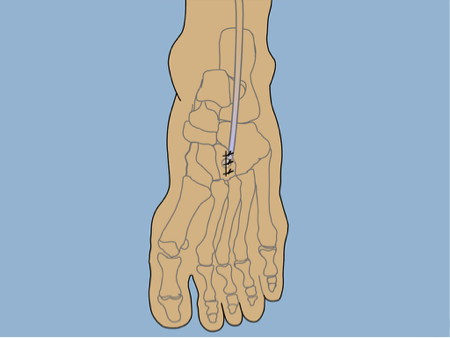 This procedure comprehensively addresses the cavovarus deformity of the foot. If there are significant clawtoe deformities, an extensor hallucis longus transfer can also be performed. This is known as a Jones procedure. 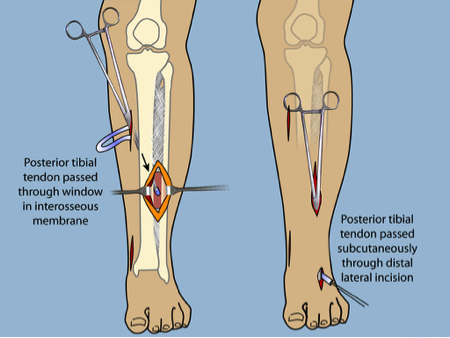 Following surgery, a short-leg cast is applied with the ankle in a neutral position. The patient is non-weight bearing for six weeks, followed by gradual partial weight bearing and three months of aggressive physical therapy. The cast is removed approximately eight weeks after surgery. Full weight bearing is allowed about four months after surgery. At that time, the patient can wear a normal shoe.